Are you looking for a way to stir up your Friday nights? You've done all the standard date nights. You've gone out for a night of bowling with friends. That was fun in a wholesome way but it wasn't something you'd look forward to during the long work week. Then you tried going high brow. You headed out to some theater and while you're sure the cast did a wonderful job performing Arsenic and Old Lace, you were a little embarrassed when your date caught you dozing off. It's time to think beyond what you, as a person, might do on a Friday out. Think about what you, as a vampire, might want to do on the weekend! 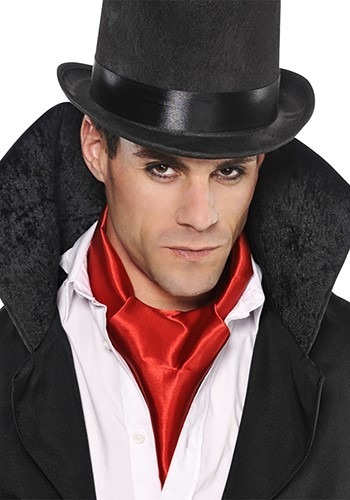 No vampire's ensemble is ever complete without silky red accents. It measures just under five feet long. Simply throw on whatever vampire wear suits you best and tie this shining scarf around your neck and you'll look ready to stalk the night. Vampires are ageless. That's part of the charm, right? If you want to look long in the tooth in just the right way, accessories are key. Throw on your gorgeous red scarf, smooth back your hair and put in your long teeth and watch as your vampire attitude reigns free!